It is, of course, morally offensive to anyone who grasps the evil of Hitler’s murder of 6 million Jews, to compare it to any other crime. A general rule of thumb about Hitler comparisons is to not make Hitler comparisons. But to compare it to a public policy choice like the opposition of school boards to charter schools would be doubly offensive if it were not so utterly ridiculous. 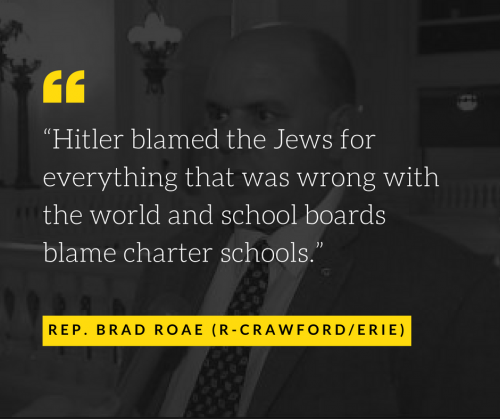 Roae’s rhetorical bombshell demeans not just the work of those of us who try to analyze and advocate honestly for good public policy, but also the work of the many legislators on both sides of the aisle who take their responsibility to help produce good public policy seriously. Roae owes all of us an apology.